The experience with the Huaorani was really unlike any other. Visiting the depths of the Amazon with natives who really knew the territory was unforgettable. 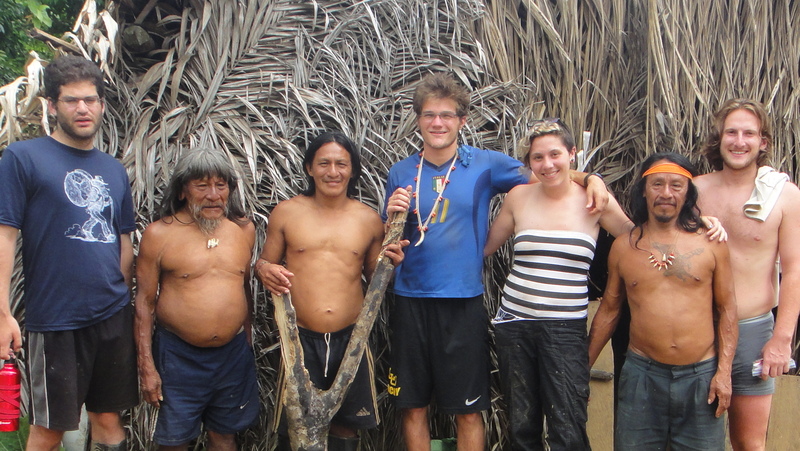 I learned so much with the Huaorani, and it truly is knowledge I will take with me wherever I go. Someday, I hope to go back, but for now I enjoy the memories I have of the very exciting time I was lucky enough to share with the Huaorani. Truly an unforgettable experience; a trip into the heart of Huaorani territory is like traveling back in time a few thousand years: The jungle was so pristine and the wildlife so amazing. We saw hundreds of species of birds, bats, insects, and reptiles, not to mention the monkeys, which were everywhere. This is an experience unlike any other. In a word, my experience with the Huaorani was unforgettable. In several words, it was unique, intimate, educational, eye-opening, breathtaking, special and altogether amazing. In my seven days with the community I saw scenery, wildlife, and culture that most people only read about or see on television. The ride down the Tiguino and Conanaco rivers, into the secluded heart of the jungle, was filled with monkey, macaw, and toucan sightings, and my time in the community was full of elemental, pure fun: I learned how to climb trees like the Huaorani, had mud-fights in the river with kids, silently canoed through a lagoon to see anaconda, practiced throwing spears and shooting blowguns, and learned about a culture that until fifty years ago had never seen a westerner. And the best part was that the Huaorani were eager to share all of it with me. From the day I met them in Coca, they were friendly, outgoing, and eager to learn about my culture and share theirs with me. I wasn’t merely a visitor; I became a part of a large family that I will never forget. Thank you! I spent nine days living with the Huaorani and experiencing their culture. To have the opportunity to actually share their lifestyle and join in their activities is truly incredible. Hunting, fishing, swimming, dancing- we weren’t just tourists, we actually participated in community life. It was an amazingly personal experience and I’ll never forget the friends we made. My experience in Ecuador with the Huaorani of Bameno was without a question the most incredible experience of my life so far. Living with this indigenous Amazonian tribe for nearly a week really gave me a new perspective on culture, values, and life in general. It was incredible to see such an “unmodernized” people, “primitive” by popular American standards, living in such contentment and harmony in the heart of the Amazon. Witnessing their lifestyle and culture, and hearing the story of their fight to preserve their home and traditions, made me question the values of the society I have grown up in, as well as my standards of happiness. Living in the Amazon rainforest for nearly a week and observing that people can live in a natural setting without destroying or polluting it also gave me a strengthened appreciation for nature and its preservation. This experience truly impacted my life for the better. I’ve been to Ecuador many times, but never had I seen the Amazon from the perspective of indigenous people. Being in the jungle, chasing after peccary, learning about the Huaorani lifestyle was one of the most eye-opening experiences of my life. Their ability to find all the resources they need in the rainforest is an incredible feat, which has made me realize how important the forest is to preserve their culture. Besides the culture shock, another aspect that made the trip even better was the welcome we got from all the Huaorani of Bameno. They wanted to learn from us as much as we wanted to learn from them; fun times were inevitable. This was by far the most incredible trip I have ever taken. The natural beauty of the Amazon, combined with the friendliness and openness of the Huaorani, made this experience truly life changing. From the first day, when we went jogging into the jungle hunting small pig, to the last, when we spent our final hours playing soccer with the kids, we were immersed in an authentic and enriching environment that is hard to find anywhere else. It is like we had leapt into the pages of National Geographic and found some of the nicest people on earth. I would not trade this experience for any other. While I was initially wary about the trip into the rainforest with the Huaorani, I came out of my week adventure with some of the best experiences of my entire life (no joke). The trip had everything I wanted in it–treks through the Amazon rainforest, hunting for wild boar, a boat ride through undisturbed primary forest, tropical bird watching. We saw animals doing things I’d thought I would only see on national geographic, from monkeys jumping 25 feet to an anaconda regurgitating its last meal. More importantly, the relationships I developed with the trip planners, the leaders, and even the tribe will last a lifetime. Everyone was extremely open and nice, and made the trip plans flexible enough so that I could do whatever I wanted to do. Whether it was literally hunting/picking our dinner for the day, swimming and bathing in the Amazon, or shooting a blow dart 30 feet, I enjoyed every moment of the trip and would go back in a heartbeat. In a word, the trip was dazzling. The Huaraoni offer an experience that is truly unique in the Amazon. The community of Bameno is located deep in what is known as primary tropical rainforest. This tract of jungle is completely untouched and yields sights and sounds that can been seen and heard nowhere else in the world. The Huaraoni are able to provide access to places that hardly any Northerner can get to and that are vastly more special than the the typical nature reserves offered by larger commercial tour operators. We saw dozens of species of reptiles, ranging from two inch skinks to 30 foot anacondas, hundreds of bird species, including just about every colour of macaw, river dolphins, all the new world simians. We even fished for piranha. I must add that this list is not exhaustive. The invertebrate life of the forest was as amazing as anything I had ever seen. Butterflies of every hue, insects adapted to every possibly niche imaginable, and more than once I had an argument over whether we were looking at a leaf or a bug. Living with the Huaraoni for a week was itself and experience. The Huaraoni culture is an ancient society that still maintains much of its pre-contact (i.e. pre-1964) way of life. Ante el primero contacto was a phrase heard often. Being able to engage with and learn from such a unique community was truly eye-opening. The Huaraoni offer a vision of the world that allows us to challenge our preconceived notions of abundance and fulfillment. They are also just a lot of fun. Anyone who travels to Bameno should take as much time as they can to get to know the villagers. The memories of living with, and experiencing even for a moment in time, the daily lives and love of the Huaorani culture will stay with me for a lifetime. From morning canoe rides up the Cononaco river and night excursions into the jungle in search of exotic fauna, to hiking amid the greenest and most abundant forest I have had the pleasure of seeing firsthand, followed by practice lessons in the various Huaorani traditional hunting techniques; everyday spent in the Amazon was non-stop adventure. But, for me, it was meeting the Huaorani people themselves that has been one of the most extraordinary delights of my life to date. While fierce and loyal and strong, they are at the same time playful and mischievous and teasing. Our days were spent in happy discovery of their traditional pastimes and festivities, and to exist even for a week among them was to see firsthand a culture full of smiles and friendship. In short, one of the best trips I have ever been on. I would go back in an instant if I could! My trip to Bameno was everything I could have hoped for and more. For nature lovers, the Ecuadorian rainforest offers the chance to see a breathtaking assortment of plants and animals you can’t find anywhere else. But the real joy of the trip was getting to spend time with the Hourani. The community was so welcoming and interested in sharing their experiences and way of life with us. Besides having a great time, I left with a greater appreciation of the value of the rainforest, the need to protect it, and the challenges facing those who depend upon it. El día que salimos de Bameno, sentada en un restaurant esperando mi primer almuerzo fuera de la selva después de un viaje de cinco días, solo podía pensar en que quería volver. Sentía muchas ganas de seguir conociendo a los Huaorani, de seguir aprendiendo su historia y su presente. Quería seguir compartiendo la experiencia de vivir en su casa, en su selva, de observar y compartir su modo de vida y sus tradiciones. Habiendo nacida en un lugar tan lejano, tan distinto, fue hermoso sentirme bienvenida y siendo tan ignorante de los Huaorani, su vida, sus tradiciones, y del lugar de donde viven, en muy poco tiempo la comunidad de Bameno me mostró y me enseñó muchísimo más de lo que podría anticipar. Estoy muy agradecida de haber conocido a los Huaorani, a los niños, quienes sin dudar me invitaron a jugar, a los jóvenes con quien pude compartir risas y charlas sobre cosas en común, y con los ancianos – poder tener el privilegio de escuchar sus historias únicas, que nunca imaginé que iba a escuchar. Un viaje que superó mis expectativas y sin duda mi imaginación. The day that we left Bameno, sitting in a restaurant awaiting my first lunch outside of the forest after a trip of five days, I could only think about returning to the community. I felt a great desire to continue getting to know the Huaorani, to continue learning their history and their present reality. I wanted to continue sharing the experience of living in their home, their forest, of observing and sharing in their way of life and their traditions. Having been born very far away, so distant, it was incredible to feel so welcome there. Being uniformed about the Huaorani, their lives and traditions and about the place where they live, in very little time the community of Bameno showed me and taught me a lot more than I could have anticipated. I am so thankful for having met the Huaorani, for having met the children who invited me to play with them, for having met the young Huaorani with whom I shared laughs and conversations about things in common, and for having met the elders – for having the privilege of having listened to their unique stories that I never imagined I would ever hear. This was a trip that exceeded my expectations and was without a doubt more than I could have possibly imagined. The sincere tolerance and friendliness among the Waorani would force me from the beginning of our 4-day stay with this Indian tribe to be curious and open-minded to the respective individuality of these people. As well, it would definitely hold a mirror to myself. When the plane dropped us, after a one hour flight, in the middle of the Amazon (Yasuni National Park), I felt somewhat handed over to this tribe. Although I thought I was well prepared and with an open attitude for everything that might come to me, I caught myself very quickly flooded with preconceptions about how we would get along. With not too much Spanish knowledge, it was an anxious beginning. The Waorani helped me very quickly to get rid of this uncomfortable feeling. Due to their openness, they invited me kindly to reflect on life. I’m absolutely sure that it was not their intention to do so, but they just had that effect on me. It needed the right kind of energy to do a homestay in this village. Central during our stay were the Jungle tours. Mostly we were accompanied by a number of men of the tribe. On other occasions, the children accompanied us as well on these journeys. We learned about the mechanical and medicinal functioning of plants, we spotted little animals, we fished on piranhas, and we plodded on with our boots through the mud, we ate what the forest could give us. Above all, it struck me how the Waorani live up in these forests and how they were even more surprised and excited about their own jungle than myself. They were proud of and enthusiastic with every aspect of it. At first, I didn’t understand the complexity of this jungle at all, but after a few days it started to dawn on me how every square meter jungle has the potential of so much more, ranging from snake poison control, palms to make cords and baskets, leafs to make shampoo, worms and aunts to eat….. The knowledge of the Waorani of these forests is particularly detailed and extended and I had not enough senses to see, to hear, to smell far ahead or to be aware of every small but meaningful change in the environment, like they did. The Waorani youth affected me probably the most. Although babies seemed to hang all day on the breast and chest of their mothers, from the moment children make their first steps, they take part in all children’s activities. All of them were very tolerant and full of fun with each other. During the day, they ran in and out the water, rolled in the mud and they had no trouble swimming upstream or climbing into the trees. Whatever they did, they were always full of joy and full of life, sweet and tolerant to each other. To us, they were curious and polite, but at no time intrusive. The older children took partially part in adult tasks and showed a great helpfulness and brotherhood, which will persist into their adulthood . All this was in itself a rich experience. It was nice that I could share this experience with my partner and two teenagers. They were at least as intimidated, impressed and felt embraced by the spontaneity and courtesy of the children and adults there. It put everything in perspective. Yet, there was more… The Waorani is only one of the tribes in the Amazon forest, but the only tribe that tries to connect with modern civilization. It is a difficult exercise to maintain authenticity and yet be open to so much modern technology. An authenticity that seems primitive on first sight, hides an enormous complexity, but is restricted in health care and education. An Amazon, rich in petroleum, a goldmine and an open door to technology. Forced by the oil companies and the government, it seems an unfair battle and extremely difficult for the Waorani to find such a balance. One thing I learned for sure: the Waorani know for themselves exactly what they want or need. Our trip to the Huaorani territory was absolutely incredible. Their community and culture is unlike no other! They were very inviting people and we learned so much that we will take with us forever. It is incredible to actually see a society that is capable of truly living off the land- We thank the Huaorani for the experience and hope to educate as many folks as possible about the fight for Huaorani territory!